For other uses, see Tanabe-Sugano diagram. A temperature–entropy diagram, or T–s diagram, is used in thermodynamics to visualize changes to temperature and specific entropy during a thermodynamic process or cycle. It is a useful and common tool, particularly because it helps to visualize the heat transfer during a process. For reversible (ideal) processes, the area under the T–s curve of a process is the heat transferred to the system during that process. Working fluids are often categorized by on the basis of the shape of their T-s diagram. An isentropic process is depicted as a vertical line on a T–s diagram, whereas an isothermal process is a horizontal line. This example T–s diagram shows a thermodynamic cycle taking place between a hot reservoir at temperature TH and a cold reservoir at temperature TC. 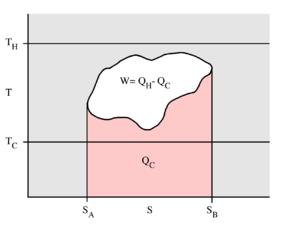 For reversible processes, such as those found in the Carnot cycle, the area in red QC is the amount of energy exchanged between the system and the cold reservoir. The area in white W is the amount of work energy exchanged by the system with its surroundings. The amount of heat QH exchanged with the hot reservoir is the sum of the two. The thermal efficiency of the cycle is the ratio of the white area (work) divided by the sum of the white and red areas (total heat). If the cycle moves in a clockwise sense, then it is a heat engine that outputs work, if the cycle moves in a counterclockwise sense, it is a heat pump that takes in work and moves heat QH from the cold reservoir to the hot reservoir. ^ "Temperature Entropy (T-s) Diagram - Thermodynamics - Thermodynamics". Engineers Edge. Retrieved 2010-09-21. ^ "P–V and T–S Diagrams". Grc.nasa.gov. 2008-07-11. Retrieved 2010-09-21. This page was last edited on 31 December 2018, at 10:31 (UTC).